BLOOMINGTON, Ill. — Rosetta Clay, formerly Menlo College’s executive director of alumni engagement and development, has been named assistant vice president of engagement at Illinois Wesleyan University. Clay brings to the position over a decade of experience in alumni relations as she leads initiatives for IWU alumni, parents and friends and The Wesleyan Fund. Clay began working in development and alumni relations at the University of Maryland in 2005. In her role as director of alumni programs at Maryland’s Robert H. Smith School of Business, beginning in 2007, Clay restructured the Alumni Chapter Board and launched a successful Regional Alumni Clubs program. 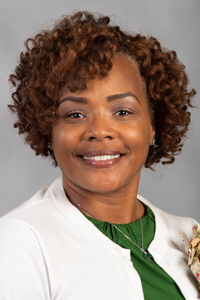 She went on to become the associate vice chancellor for alumni relations and executive director of the alumni association at North Carolina Agricultural and Technical State University from 2014 to 2016. Clay led a rewrite of the alumni association’s strategic plan, in addition to developing a university-wide strategy for alumni engagement. Most recently, Clay was responsible for Menlo College’s alumni engagement, fundraising and marketing communications program. Her work there resulted in a $125,000 increase in annual giving. Clay earned a bachelor’s degree in mass communications from Southern Illinois University Edwardsville and a master’s degree in marketing management from Johns Hopkins University Carey Business School.